Get a high performance server for your business with the HPE ProLiant DL380 Gen9 Rack Server. Packed with dual Intel Xeon E5-2690V4 14-core 2.6GHz processor & 64GB DDR4 SDRAM, it provides high speed processing for a reliable business operation. With integrated Matrox G200eH2 Graphics Processor, it also supports graphics based application. Its support for up to 768GB RAM, makes it ideal to meet the growing requirements of your business. Its eight hot swap 2.5�drive bays with SATA 6Gb/s or SAS 12Gb/s interface and built in RAID controller, add a massive data storage capability to save all types business data & applications. The four Gigabit Ethernet, five USB 3.0, and a VGA interface, enable easy network and peripheral connectivity. This 2U form factor rack server is certified to use with SuSE Linux Enterprise Server, Microsoft Windows Server, Red Hat Enterprise Linux, Oracle Solaris, Citrix XenServer, & Canonical Ubuntu operating systems, making it suitable for almost all types working environment. With two hot plug 80 PLUS Platinum power supply unit and power redundancy feature, it is designed to give continuous availability for critical business applications. 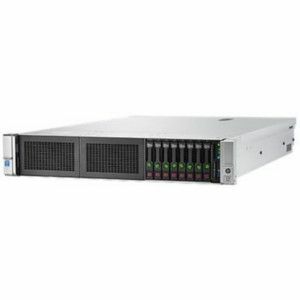 Purchase the HPE ProLiant DL380 Gen9 Rack Server at the earliest!